In 1840, Milo Warrick, a native of Beaver County, Pennsylvania, came to Clarkson, Ohio and built a home for himself and his family. Milo made cabinets and coffins and by that token entered the undertaking business. In 1863, when coffin manufacturing companies were established and were able to sell their products cheaper than Milo could make them, Milo discontinued the cabinet and coffin making business but continued as the community undertaker. Milo Warrick's son, Clark, assumed the management of the Warrick Funeral Home in 1880 and his grandson, Harry C. Warrick, followed as manager in 1920.Everett H. Warrick, also a grandson of Milo, became associated with the funeral hone in 1925. When the funeral home was moved to Columbiana in 1926, the original part of the present building was purchased as Harry's personal residence. Everett came to Columbiana with his cousin, Harry C. Warrick. Everett and his wife, the former Miriam Detwiler, purchased the funeral home from his cousin, Harry, in 1966. In 1968, John F. Kummer of Poland, Ohio, a licensed funeral director and embalmer, was employed by the Warricks to assist at the funeral home. 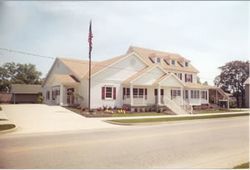 In 1973 John became a partner and in 1975 the name was changed to the Warrick-Kummer Funeral Home. In 1990, an open house was held to celebrate 150 years of operation and was reported to be the oldest funeral home in Ohio operating within the same family. When thinking of this family's period of operation, it is interesting to note that Everett was only the third generation. John and his wife, the former Wonda Jean Noel, eventually purchased the business and property, and also the property to the north, which for years was the home of the former B&N Trucking Company. Over the following years, most of the B&N buildings were torn down. In 1999 a large addition was added, doubling the floor area for calling hours and services. The lower level of the addition made possible a large central office, a dedicated arrangements office, new selection room and other office area. A "state of the art" preparation area with separate dressing and hairdressing area was also added.